My parish hosted our first Catholic Women’s retreat earlier this year. When we started planning the retreat, we decided to start from scratch and create a retreat to best reflect and meet the needs of our parish women. None of the organizational retreats out there really met the goals we wanted for our parish ladies. 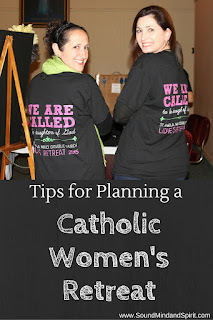 Creating a Catholic women’s retreat from the ground up was a bit overwhelming at first and we learned much along the way. 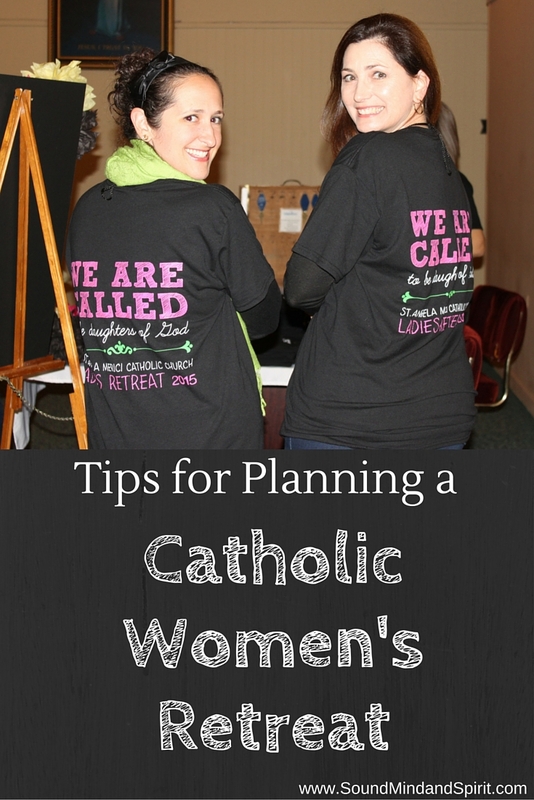 Since this was my first time planning a retreat, I thought I would share a few tips we learned and will use in planning our next Catholic women’s retreat for 2016. 1. Create a Retreat Planning Team – Invite a group of women who will represent the women in your parish or the potential audience for your retreat. Identify people who will work well together with respect, but don’t necessarily think exactly the same. A unique and different perspective is beneficial to creating a retreat that will appeal to more women. Create opportunities for your committee or team to get to get to know each other, grow in trust and bond as a team. 2. Establish Goals for your Retreat – Prayerfully consider what you hope to accomplish with your retreat. What experience do you wish for retreat attendees to experience? Your goals will set the course and tone and will guide your planning. Our goals were three-fold. We wanted to bring parish women into a deeper relationship with God, to rest, relax and enjoy the weekend and to come together in fellowship as a community. 3. Identify your Potential Audience – Who would you like to see attending your Catholic women’s retreat? Is it for moms, married women, retirees, single women or all of the above? Are you hoping to attract a specific type of Catholic woman or a cross section of your parish women? Early on we agreed we wanted all women from our parish to feel welcome to attend the retreat. We weren’t focused on one type of Catholic woman. And, we wanted all Catholic ladies to feel comfortable at the weekend, no matter where they were in the faith journey. Inclusive, not exclusive was our constant motto. 4. Planning Activities - Keeping your goals in mind, brainstorm what types of activities you would like to see and what each one should accomplish at the retreat. For ours, all of our activities had to relate to at least one of our goals, and come together to fit the overall tone of the weekend. Faith – Our first goal was helping women create a deeper relationship with God. Activities with this in mind included – Talks reflecting faith, scripture and personal testimony; Adoration, Mass, Opportunity for Reconciliation, Guided Meditation, Spiritual Direction, Discussion on Saints, Rosary Walk, and Small Group Discussion. Rest and Relaxation – We wanted our women to enjoy the weekend away from home and to take a breath from their every day lives. We selected a peaceful retreat center with semi-private rooms nestled in the woods that provided (and cleaned up) all of the meals. - Long breaks between sessions gave them time to take a nap, go for a walk in the woods, take a Pilates class, or simply enjoy time by themselves or with others. Fellowship – Our third goal was to encourage community within our group of women. When creating the small groups, we sat the ladies in a way to encourage them to meet new women. The first night included fun get to know you activities that encouraged small group discussion and a reception time before lights out for another opportunity to meet. Our mealtimes were relaxed and we hosted a pajama party/game night the second night for more fellowship time. 5. Pray Constantly – Planning a Catholic Women’s Retreat may at times feel overwhelming. Remember to pray and invite the Holy Spirit to guide your planning. Always turn to prayer in disagreements or choosing a direction for the retreat. Let the Holy Spirit guide your efforts. Finally, as things will go wrong or don’t follow the plan, give it up to God. Trust that He will be present working in both the planning and at the retreat. When it was all said and done, our retreat had hiccups, things we planned but didn't finish and last minute changes, but I believe our retreat ended up accomplishing exactly what we hoped it would. We helped our parish women grow in faith, rest & relax and connect with one another. In the last few months since we arrived home, the fruits of our weekend retreat are on display at our parish. And, we are already being asked about the next retreat! Planning our first retreat was such hard work born out of love for God and our parish community that we wish to pay it forward to others wanting to plan a Catholic Women's Retreat. Our retreat team is currently working to put together our Catholic Women's Retreat plan into a pdf format to share online. If you are interested in finding out more about the retreat resources and materials as they become available, please consider joining our email list below. We promise not to share the list or spam you. What tips would you like to add? 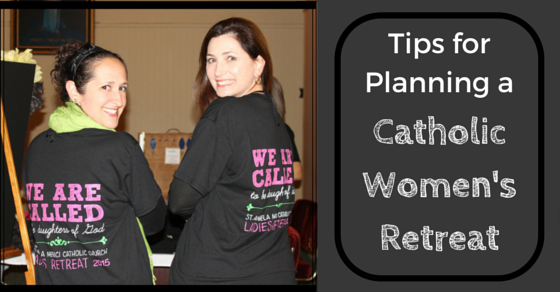 What were the goals for your Catholic Women's Retreat?